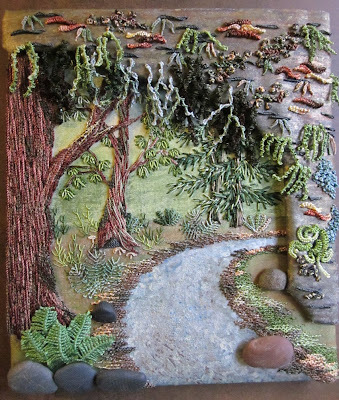 Adventures in Stitching: Forest, Finished! Done! Yay! 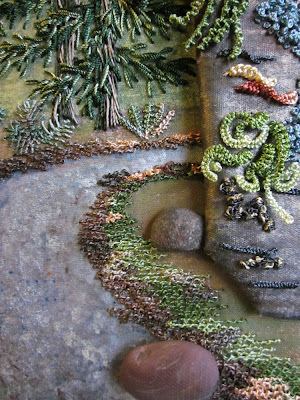 This is one of those rare stitched pieces that really can't be considered complete until the framing is complete, too. 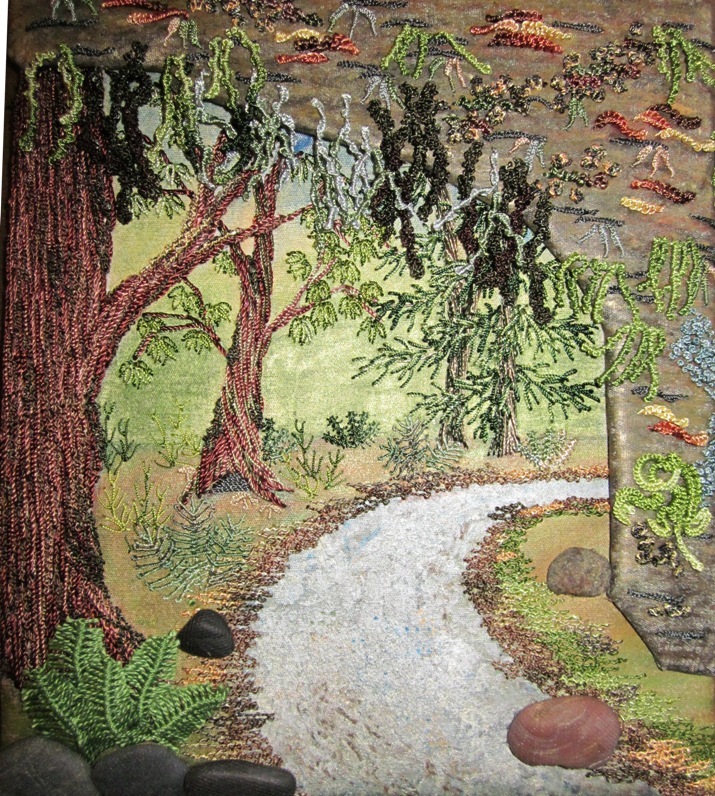 This forest is DK Designs' "Enchanted Forest" brazilian embroidery design, using the recommended EdMar threads. 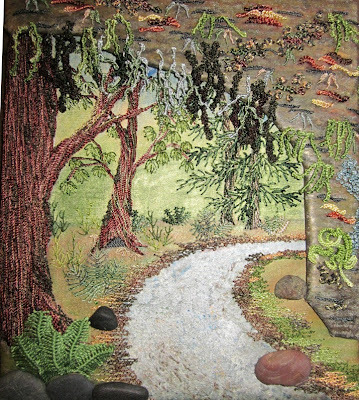 But what I liked best about it was the freedom, she lists the stitches used and the approximate placement, but it is really up to your own eye where you put them precisely. 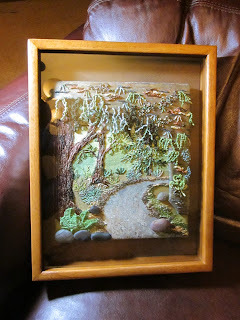 My version is really pretty different from the photo of the model included with the instructions. EdMar threads are rayon, with a "z-twist", which is backwards to the twist of most other threads, so they can be slippery and tricky to work with. However, they are really tough and you don't need to be afraid to use a lot of force on the bullions and other tough stitches. A few really fun things I hadn't tried before were what attracted me to this design. The first was the use of Shiva Paintsticks to create the background image on which to stitch. 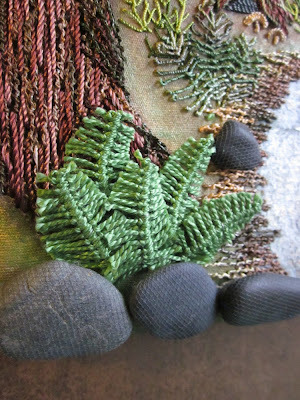 The other is the use of actual rocks attached to the work. How was that done? Look closely at the rocks below and see if you can figure it out. 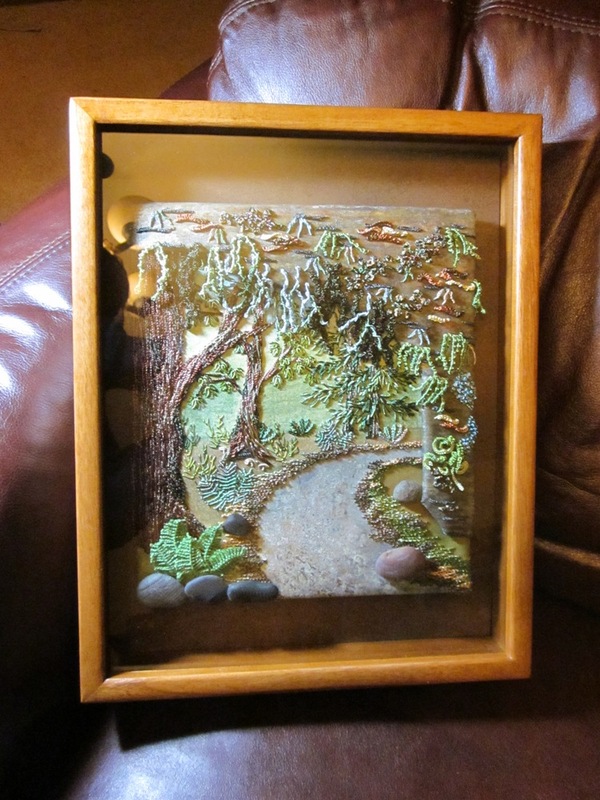 I am really glad I did this piece, it was a great learning piece and stretched my skills. My perfectionist brain knows where I would have done a few things differently, but I mostly did it for the experience, anyway. I'm itching to work on one of my own original designs again now, which is really cutting down on progress for my older WIPs, but that's just the way the cookie crumbles. Wow, it's really a masterpiece! Very beautiful, congratulations!